The Neighborhood Ledger. The incredible real estate newsletter that sets you apart! Send your prospects information that matters! A s busy real estate professionals, the last thing we need is to think too long and hard about how to market ourselves each month. It’s time-consuming and often keeps us from marketing at all. Here’s where The Neighborhood Pin comes in. It’s designed to help take the pain out of marketing, and still send a powerful and engaging message to our prospects. The Pin is both unique and powerful. It’s a 30-day or 60-day postcard subscription, designed to have shelf-life and be easy-to-read. The eye-catching layout and rich content allow it to be something the homeowner can look forward to on a regular basis. To become a “Pinner,” simply fill out the form below, and a representative will get right back to you. Put a smile on your prospect’s face, send The Pin! Oh, and by the way, when you purchase a subscription, your route is protected, and as long as you are current on your mailing, and we won’t mail any other Neighborhood Pins to your farm area…you own it! Are these carrier routes available? Enter addresses in the area you want to farm. You must enter the full address including St., Ave, Ln. etc. as well as Zipcode. We will find the carrier routes and send you an estimate. Separate multiple routes with a comma. These can be obtained from eddm.usps.com. 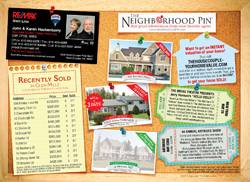 he Neighborhood Pin is a postcard subscription which may be purchased on a 30- or 60-day plan. It was designed to address the real estate agent’s quest to offer their farm area something unique, and valuable on a regular schedule. The Pin was engineered to have shelf-life and be easy-to-read, unlike the standard newsletter. The eye-catching layout and rich content make it something the homeowner can look forward to receiving. The Pin has been registered with the US Government for copyright protection. We can find availability and estimate your project for you. Simply fill out the form to the left. We’ll get back to you within 1 business day. If you want to get this going right away, the best way to get started is to go to eddm.usps.com and research your area to determine how many properties there are in the carrier route(s) you want. The map tool is easy to use, simply follow the instructions on the USPS EDDM site. You must mail the entire carrier route, no exceptions other than those residents that have requested that you “Do Not Mail” them. Use those totals you obtain from this tool to determine the total cost of mailing. The “quantity ranges are shown in the chart below. NOTE: the prices on the EDDM® Mapping Tool are postage only, and do not figure in the final pricing of The Neighborhood Pin. You can fill out the contact form to the left and we will be in touch with you within 24 hours. Here is a video to show you how to use the mapping tool. What is the size of The Pin? One of the great benefits of using EDDM is the ability to use an oversized format. The size of the postcard is a whopping 9″ x 6.5″, and is printed on a beautiful super-glossy 14PT postcard! What content changes on The Pin each month? **Some brokerages may give permission to use a property that is not your transaction. Can I market with co-sponsor or lender? That depends on your Agency, State and Local regulations. But in most cases the answer is Absolutely! We can design the cosponsor’s ad for a fee or we can accept a hi-res .PDF file from the cosponsor’s marketing department. We have templates available for the co-sponsor’s marketing department. We can provide space for a 50%/50% split in cost, or a 75%/25% split. The templates are designed to equally proportion the amount of contribution to equal the amount of advertising space. We will bill each participating client separately, noting the total cost of the mailing, and referencing the partner and percentage clearly on each invoice. We require written sign off of proof via email from both parties for any sponsored newsletters. How do you avoid the homeowners from receiving The Ledger from more than one agent? We use EDDM® (Every Door Direct Mail®) which automatically “locks-up” your route. EDDM carrier routes are the mail routes of each individual postal carrier. No lists are ever needed, no labeling or addressing. We simply note your route number and make it unavailable to anyone else as long as you remain current on your mailings and payments. Yes, there is a $59.95 one-time set-up fee for the basic layout. Any custom work is additional, and will be billed at the rate of $65.00/hr. For the basic layout, we incorporate any agent contact and office info, designations, logos, etc. There are no changes in designated agent areas in the newsletter, except for a change in office location or agency. What do I need to do each month? 1. An email from your MLS provider with 10-12 settled properties within your farm area. Send in a client 1-line format if possible. It’s important to include “how far back” you went in the body of the email to get this list; i.e. 30 days, 45 days, 12 months, etc. 2. An email from your MLS provider with 1-3 feature properties. These must be your transactions, unless other permissions are given for use. If you represented the buyer on any or all, you must provide the photo. The MLS photo cannot be used by the buyer’s agent. Please note any callouts, i.e. Just Listed, Under Contract in 30 Days, etc. Yes, there is no obligation or cancellation fee. Note that once you cancel or fail to pay the subscription for any reason, that carrier route will be made available immediately to the next in line on the waiting list. Cancellation must be made on or before work begins to the current mailing, or time spent may be billed. What makes The Neighborhood Pin so different? Pricing is per piece, and assumes one design file. Pricing based on one post office drop location. Multiple drops at different post offices will incur additional charges.